In our previous installment, the crew of the Percival Lowell arrive at their new ship in preparation for their historic journey to Mars, only to find a most unexpected stowaway . . . The crew gathered in a circle around the duffel bag out of which poked the furry gray head of a cat who, once he caught sight of Boggins, purred inquisitively. For a few moments, there was silence as no one knew what to say. Boggins broke the spell. “Can we keep him?” he asked to no one in particular. “Absolutely not!” replied Endicott flatly and without hesitation. “Aw, why not?” Serrona said in a soothing French accent. He reached out his right hand to the bag, scratching the cat behind its ears and causing the cat to purr even more loudly. Clearly, it was adjusting fast to its gravity-less surroundings. “All our consumables are balanced for five,” Endicott said. “Food, water, air, and everything else. We can’t disrupt that now. Right, Colonel?” Endicott looked at Braden, who floated next to him. Braden looked at the cat and at the rest of the crew, all of whom clearly agreed with Serrona. She was glad to see that, because she too was inclined to keep the cat despite the fact that it broke every regulation in the book. Or was it because of that? “This isn’t up for a vote,” Braden said. Everyone nodded solemnly. Braden paused as she thought about what to do next. “What’s his name?” she asked Boggins. “Colonel, you can’t be serious!” Endicott fumed. “It’s a ‘he,’ skip,” interjected Boggins. Endicott’s mouth twitched as he fought to keep from smiling. Then he turned to the handful of launch technicians floating nearby. “Hey, fellows,” he said, gesturing them over. The technicians floated over. “Yes, sir?” said the senior one. Endicott turned around to face the crew. Everyone was smiling. “Back to work, then, everyone.” He clapped his hands. Braden lingered a moment, then touched his elbow. “Good call,” she whispered. “I was outnumbered anyway,” he said with a faint grin. “A good leader should alway know when to listen to the crew.” He winked. A week later, space station Peary was packed with space-accredited reporters with cameras and recording gear in preparation for the launch of the USSES Percival Lowell to Mars. The crew was all business as they made final preparations for departure. The first stage of the mission was to burn the three first-stage engines — called the PM-1 stage — to a higher orbit that would align them for a Mars trajectory, then jettison shields protecting the Lowell and the booster engines from damage by meteoroids that they might hit in low orbit. From there, they would fire the PM-1 stage again to put them on course to Mars. The departure from high-earth orbit was the real beginning of the mission, but for the millions of people around the world watching on television and listening on the radio, the real beginning — just as with a launch on earth — was when the rockets first ignited. On board the Lowell, the crew were seated and strapped into swivel chairs in the command and control center — or C-Three, as the crew had nicknamed it — on Deck Two. It was a tight fit, but everyone had their panels to monitor during the critical phases of the flight. Before strapping himself in, Boggins had made sure that Percy was tucked in comfortably in his bunk up on Deck One. “T-minus two minutes,” intoned Mission Control through the overhead speaker. Braden acknowledged the call as the crew continued to monitor their panels, calling out readings and status reports in short, crypic bursts as required. Even so, Braden could sense the excitement in the air. Per the checklist, the crew tilted their seats back 30 degrees to help distribute the pressure of acceleration. The countdown proceeded smoothly and without hiccups, and as the whole world watched, the clock reached the final seconds. An audience estimated to be almost as large as the one that watched Neil Armstrong set foot on the moon just two years earlier was eagerly awaiting what came next. Far below them, the crew heard the first-stage nuclear propulsion engines rumble to life. Fuel pumps, gimbal motors, and more began to operate. Braden studied her panel; everything was reading right on the money. She breathed a silent thank-you to the people who built the ship so well. This was just the first of what would hopefully be many missions of exploration for the Lowell. But it would also be the mission that would reveal anything they had somehow overlooked. “Ignition!” All the world’s eyes saw the blossoming yellow-white engine exhaust, which appeared so different than an Earth launch — no billowing smoke, no bone-shaking roar. Just three bright lights as all three PM-1 engines lit and pushed a spherical ball of exhaust behind them. Even so, it was dramatic and exciting as the three dots of light clearly began to move away from the Peary. “Godspeed the crew of the Lowell as they take the next giant leap for mankind,” called a familiar voice — General Carstairs, the man in command of the Mars project. Aboard the Lowell, the ignition was much less dramatic than a typical Earth launch. There was no buffetting, and the vibration was minimal. Because the engines were so far away from the crew module and there was no external atmosphere to carry sound, the crew could clearly hear their instruments and the radio calls over the distant hum of the burning engines. The acceleration pushed them down into their seats, but not uncomfortably. All in all, it reminded Braden of a high-speed elevator ride. “All systems go,” called Endicott. “We’ve cleared the Peary. We are underway.” He turned to the crew and smiled, and four eager faces smiled back at him. Braden consulted the master checklist “Next item: interstage and shielding jettison at launch plus fifteen,” she said into her mike, followed by an acknowledgement from mission control. “Heliocentric orbit, here we come.” Everything was going without a hitch — a good omen for the mission to come, even though Braden wasn’t one to believe in omens. While all was calm in the crew module, on Earth there was jubilation and celebration everywhere — in private homes where people watched from their living rooms, in public squares where people gathered to watch giant screens on scaffolds, in pubs and bars where the TVs had been switched over from baseball games that had been stopped anyway so that the crowds could watch and hear from the stands. For another brief moment, humanity stood as one people as they sent ambassadors of their kind out into the void of space. Though the Lowell was far away from Earth and getting farther with each second, the crew were not immune to the feeling that they were representing all of those people, carrying their aspirations with them, representing the best of them. For the first time, the profundity of what they were undertaking began to really sink in. The tension dispelled, the crew had a good laugh — causing some perplexed faces at mission control. Now that the ship and its crew have embarked on their historic journey, what perils and adventures await them on their flight path to the red planet? 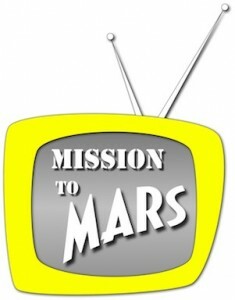 The story continues in the next installment of Mission to Mars! In our previous installment, Colonel Elizabeth Braden meets the crew of the Mars expedition for the first time as their new commanding officer when the crew is introduced to the media at a press conference. Although Major Marshall Endicott, the mission’s second-in-command, is uncomfortable with the choice of Braden over himself as the mission’s leader, the two of them make an uneasy truce. How long it can last, though, remains to be seen . . . The Big Gemini spacecraft carrying the crew of the Percival Lowell shed its booster stage upon reaching an orbit that would allow it to intercept Orbital Station Peary, where the Lowell was being fitted out for its pioneering mission to Mars. Another routine departure from Kennedy Space Center, with an ultimate destination that was anything but. The ferry version of the ubiquitous Gemini spacecraft — nicknamed the “Gusmobile” after astronaut and current NASA Deputy Director Gus Grissom, who had played a major role in its design — the Big Gemini featured an enlarged cabin with room for up to six passengers in addition to the two pilots up front. On this flight, Braden and Endicott were in the pilots’ seats, with Collinson, Boggins, and Serrona in the rear compartment along with several large cargo canisters strapped to the bulkheads around them. As smoothly as if they had been a team for years already, Braden and Endicott guided the Big Gemini to its rendezvous. Both of them had dozens of Gemini flights in their logbooks already, and knew the vehicle as well as their own cars. Even so, as the pudgy, donut-shaped Peary suddenly appeared from the darkness as its orbit carried it across the terminator into daylight — followed a moment later by the unmistakable javelin shape of the Lowell — both of them paused to take in the spectacle through the spacecraft’s oval windows. “Gladly, Colonel,” Endicott responded buoyantly. Tweaking his control joystick, he turned the Big Gemini sideways so the passengers could peer through one of the small portholes in the rear compartment. The three astronauts took turns peering and snapping photos, exclaiming their impressions of their Mars chariot as it grew larger in the window [see this image]. Most of the spacecraft was fuel and engines. The first stage, consisting of three white NERVA rockets strapped together in parallel, served as the “base” of the vehicle. Above this stage, two more NERVA engines sat perched end-to-end, connected by dense webs of silver struts. And at the very top end, much smaller than the engines by comparison, perched the Lowell; a slender white cylinder with a widening conical skirt at the very front [see this image]. This would be their home for the next four hundred days. “Okay, show’s over.” Endicott nudged the capsule’s nose back toward their objective. “Don’t make me pull over, Sergeant,” Endicott shot back. The communications channel filled with laughter as the Big Gemini approached the Lowell for docking. With the skill of a veteran, Endicott backed the Big Gemini toward one of the Lowell’s two logistic vehicle docking ports, located halfway up the conical nose of the skirt housing the Mars lander. Once the docking hatch at the rear of the capsule’s passenger compartment was securely connected to the port, Collinson opened the hatch and slid feet-first down the connecting tunnel that would connect to the main tunnel running the length of the Lowell. One by one, the other astronauts floated their way down the tunnels, their bulky silver spacesuits making the trip awkward. But at least they could remove their helmets at last, as the Lowell was pressurized and powered up, waiting for their arrival. “You’d better believe it!” said Boggins as he glided into the crew quarters that ringed the deck, a duffel bag slung over his shoulder. 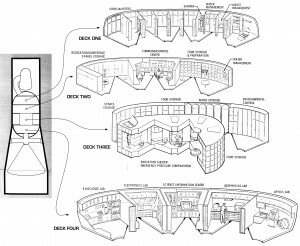 Each member of the crew had a wedge-shaped private compartment separated by a privacy curtain, which opened up into a circular common area where the crew now congregated. “Which one’s mine?” Without waiting for an answer, he tossed his duffel into the nearest compartment, only to have it rebound off the cabin wall and glide back into his hands. “Oops,” he said, blushing as the others laughed. He tried again, this time nudging it gently into his chosen space. Careful to avoid disturbing the launch crews who were intent on their work, the five Lowell crew proceeded through the hatch in the center of the circular floor to the next deck, which was divided into three open compartments: the Lowell’s command center, packed with control panels and display screens; the food and water compartment, ringed with shelves and drawers; and the conference and recreation room, which was designed to feel spacious despite its actual size. Most of the launch crew members were congregated on this floor, so the astronauts continued down through the third deck, ringed with storage tanks for air and water and dominated by a thick, puck-shaped radiation shelter to protect them against solar storms or an unlikely accident with one of the NERVA boosters, and into the laboratory deck at the base of the crew compartment. If the command center on Deck 2 was the nerve center of the Lowell, the labs on Deck 4 were the entire reason for the trip. Braden watched with pleasure as Collinson’s and Serrona’s eyes lit up at the bright, new, shiny science equipment in the five laboratories ringing the deck. “Make a hole!” Braden called ahead as she shot up through the decks, betraying her Navy-brat roots (her father was a retired nuclear submariner). The others followed, Boggins bringing up the rear and issuing a stream of curses as his knees and elbows kept connecting with the hatchways as he passed through them. “What is it?” said Braden to the two gray-coveralled technicians who floated in the center of the deck. “There,” one of them said, pointing to one of the compartments. Boggins’ duffel bag was bouncing crazily around the room, ricocheting off the walls and spinning wildly. “What’s going on?” Boggins called as he stumbled through the floor hatch into the room. “What’s the problem?” When he saw his duffel careening around his compartment, he went pale. “Oh, no,” he said with a gasp. Before Boggins could answer, a feeble, high-pitched sound emanated from deep within the bag. A moment later, it was followed by another, louder cry, the unmistakable warbling wail of . . .
A dark gray furry head poked out from one end of the duffel, its bewhiskered mouth uttering a piteous wail, its eyes open wide in confusion, its long ears cocked back in fear. “A cat?” asked Braden in astonishment. “a cat!” confirmed Endicott. All eyes turned to Boggins, who was drifting backwards in disbelief. “You . . . ?” encouraged Braden impatiently. “. . . forgot,” he finished sheepishly. The cat yowled again, and all eyes turned back to the cat as it finished struggling its way out of the bag and cartwheeled its legs wildly in the air, unaccustomed as it was to the lack of gravity. Braden and Endicott looked at each other. What will become of the Lowell’s feline stowaway? Whatever the crew decides, they’ll have to decide soon, because the launch countdown is about to start! Find out in the next installment of Mission to Mars! In our previous installment, USAF Colonel Elizabeth Braden learns that she has been chosen to command humanity’s first expedition to Mars. As a last-minute replacement for the mission’s original commander, Braden must quickly familiarize herself with her new assignment and with her crew – particularly her second-in-command, who had expected to be named commander instead . . . Standing behind a curtain, Liz Braden straightened her uniform and checked her hair one more time to ensure that it was pinned professionally in place. Following her departure from Orbital Station McKinley and subsequent landing at the Kennedy Space Center, she’d barely had time to get out of her space suit and into her uniform in time for the press briefing that General Carstairs had arranged to announce the crew of the Mars Expedition – a briefing for which, until just a few hours ago, she had expected to be in the audience, not seated at the table. “To ensure that our hand-picked crew would be able to train thoroughly and without distraction, we have until now held the names of the crew in the greatest of secrecy. But today, with the beginning of this epic mission just two weeks away, we would like to introduce them to you.” There was a pause. Braden could imagine the spokesman making a dramatic flourish. She held her breath as she looked around to the five other, equally nervous, faces around her. As the Air Force liaison to the NASA Mars Program Office, she knew these other men cordially. Now she would be spending over a year in close quarters with them. What a way for them all to meet as a crew – in the glare of a thousand flashbulbs. “Ladies and gentlemen, may I present the crew of the Mars Expedition.” Braden swallowed, stiffened her back, and stepped out from behind the curtain, her first official act as mission commander. The glare from the television lights and flashbulbs was blinding, and the sudden eruption of applause filled the auditorium like a slow explosion. Through the glare and noise, Braden concentrated on finding her way to the far end of the long conference table, and took a seat behind a tent card with her name on it. One by one her colleagues filed in as the announcer read their names. “Colonel Elizabeth Braden, United States Air Force. Commander of the Mars Expedition.” She remembered to turn and look at her colleagues as they entered and sat. “Major Marshall Endicott, United States Air Force. Command Pilot of the USSES Percival Lowell and commander of the landing mission.” Endicott sat stiffly next to Braden, pointedly not making eye contact with her. “Group Captain Nigel Collinson, Royal Air Force. Mission engineer and science expert.” The tall, ginger-haired engineer grinned dazzlingly to the crowd as he sat, his matinee-idol looks already winning the crowd. “Master Sergeant Vincent Boggins, United States Air Force. Mission communications and maintenance specialist.” Despite herself, Braden smiled at the sight of “Boggs,” her former crew chief. His stout frame and beefy face seemed ill-suited to the formal uniform he wore for the event. “And lastly, Gilles Serrona, of the French Academy, the world’s leading expert on the geology of Mars.” Braden studied Serrona carefully; the least well-known of the crew, he had been hand-picked by diplomats rather than scientists, and some felt that his presence was an intrusion. But he seemed pleasant enough, with an open face, coolly appraising eyes, and a patrician nose. Braden had made up that last sentence on the fly; the prepared speech that had been shoved in her hands on her way from the landing strip to the press conference had been written for her predecessor, John Walden, now in the hospital with acute appendicitis – and of whom none of the press would ever hear about in connection with this mission. Braden wished she could publicly acknowledge him, since he had been crucial to the success of the program up until now. For the first time, it began to sink in – she would have to carry on for him. “As our colleagues in the Apollo program continue to explore the lunar surface in preparation for our first permanent bases there, we are proud to receive the baton from them and run the next leg of mankind’s race to the heavens.” She fought to keep from rolling her eyes. Who writes this stuff? The press kept them there for over an hour, asking questions ranging from the highly technical to the highly personal. Braden was more than happy to let her colleagues answer most of them; on the surface, it made her look like a deferential commander; in reality, of course, they knew much more than she did. She listened carefully to the answers, both to inform herself and to get to know her new crew. She was pleased to see that they were clearly comfortable working together, often referring questions to each other and engaging in casual banter. But Endicott was still making a point of avoiding eye contact of longer than just a moment. Clearly, their upcoming conversation was not going to be pleasant. Once the press had asked everything they could think of about topics ranging from orbital insertion velocities to Collinson’s real feelings about Yorkshire pudding, the NASA spokesman thanked the crowd for coming. The crew received another wave of applause, punctuated by hearty cheers, as they departed behind the curtain. Safely out of sight, the six of them sighed in relief. Boggins loosened his tie and unbuttoned his shirt’s top button. They congratulated each other and shook hands, and gradually they departed one by one. Braden and Endicott lingered strategically behind. Endicott’s steely gaze bored into her. “No?” It was the first word he had spoken to her all day. Endicott snorted in disbelief, and Braden bristled. “Let it take time, Major. We’re about to have plenty of it.” They shook hands again, and Endicott left. Braden walked out from behind the curtain into the now-empty auditorium. A white plastic scale model of the Lowell was perched on a stand in the middle of the table. She stared at it a long time, trying to imagine being inside that tiny space for over a year with five people she barely knew, one of whom resented her being there. “Well, that could have gone worse,” she said to herself, then straightened her uniform jacket and walked purposefully out of the room. The year is 1971 — not too far off in the future. Emboldened by the success of Gemini, in the late 1960s the United States undertakes an all-out effort to establish a permanent manned presence in space. While NASA concentrates on the development of the Apollo moon landing program, the United States Air Force assumes responsibility for the development of Earth-orbital stations that would serve as habitats, experimental laboratories, and even industrial manufacturing facilities. Riding into space on Gemini and its successors Gemini-B and Big Gemini, dozens and eventually hundreds of civilian and military astronauts begin settling in Earth orbit. As the number of spaceships and space stations grows, so too does the nation’s confidence that its future would be found in space — that the frontiers of knowledge extended far beyond the limited horizons of the planet, over whose finite resources humans had fought for much, much too long. To keep the eyes of the nation and the world looking outward into space, and to push the space program to strive to accomplish ever more ambitious and inspiring goals, NASA and the Air Force set out to achieve the seemingly impossible — a manned mission to Mars in 1971, when the red planet and Earth would be tantalizingly close . . .
From orbit, the azure Atlantic curved below until it faded to a pale blue in the distance. On the far left horizon, a smudge of brown-green marked the Florida coast. Indistinctly at first and then growing in brightness, a yellow pinprick ascended from the coast and grew into a teardrop as it moved higher, its arc flattening as it traveled from left to right. In front of the teardrop of rocket exhaust, a silver and white Titan I booster propelled a sleek, black wedge into low-earth orbit. Inside the cramped cockpit was a single astronaut, ensconced in a form-fitting silver spacesuit, the face obscured by the dark visor on the bulbous helmet. The yellow bloom behind the Titan I’s conical engine bell disappeared, followed a few seconds later by the briefest shudder as the Dyna-Soar spacecraft uncoupled from it and fired a bank of small thrusters to accelerate it a fraction faster than the booster. On the booster, a similar set of thrusters fired in reverse. “Cape Departure, Dyna-Soar Five-Twenty. Clean separation,” the astronaut said as she nudged her craft’s side-mounted control column. The Dyna-Soar adjusted its path automatically, its onboard computer pointing the craft toward a rendezvous with a distant point of light that gradually grew in size in the cockpit window until it resolved into a donut-shaped inflatable station with a central docking core. As the Dyna-Soar approached, a pair of small doors behind the cockpit unfurled, revealing a small cargo bay nearly taken up by an airlock. The spacecraft rotated almost lazily until its top side was facing the docking module on the station. The distance between the Dyna-Soar one-man reusable spaceship and the station slowly closed as a cloudy South Pacific swept by unnoticed below. All eyes in both vehicles carefully monitored the approach. As they drew closer, the difference in size between the two became increasingly apparent; the station was nearly one hundred feet across, while the spacecraft was a mere 35 feet long. A quick burst of reaction control thrusters spun the Dyna-Soar at a fractional speed to match the rotation of the station along its axis, and then the two slid into a perfect docking connection without even a bump. The astronaut signed off and unbuckled herself as soon as she heard the clank of the hard locks. In the McKinley’s docking module, two astronauts in pale-gray jumpsuits waited for a green light on the control panel before spinning the wheel on the floor-mounted hatch and swinging the hatch open. The Dyna-Soar’s pilot floated up through the hatch, reaching out for the steadying hands of the station’s welcoming committee. “Well, at least let me get this thing off,” she said after a pause, continuing to unbuckle her helmet from the Gemini-style suit. A moment later she lifted the helmet off, shaking her head from side to side to loosen her neck and shoulder muscles. Her chestnut-brown hair remained carefully pinned to the back of her head. “This way, Colonel,” the astronaut said, gesturing toward a hatch in the wall. The two of them floated through as the other astronaut continued securing the docking area. Aside from the urgency, it was after all just another routine on-orbit arrival at the station. McKinley was essentially a giant inner-tube divided into airtight compartments. They passed through several compartments — each packed with equipment and astronauts engaged in various station and mission tasks, held in place by the station’s fractional-gee rotation — until they reached a hatch marked “General Carstairs.” The astronaut opened the hatch and gestured for Braden to go ahead of him. She glided through the hatch. Carstairs gestured to the curved walls. “I get to play with all these wonderful toys. It’s my dream job.” They both chuckled. Braden’s dark eyes widened as she stared uncomprehendingly at the general. Braden blinked, furrowing her brow as she tried to wrap her head around the fact that the night before she had gone to bed looking forward to her vacation in the Bahamas, and today she was suddenly in orbit being told to pack her bags for a 420-day round trip to another planet aboard a nuclear-powered super-rocket that would be departing in just over two weeks. “Not one like this, certainly,” he said, extending his hand. “Thank you, General,” Braden said, shaking Carstairs’ hand, a smile slowly dawning on her face as the magnitude of the adventure ahead of her began to sink in. The Bahamas could certainly wait until she returned.